However often we revisit our favourite haunts, occasionally we feel a common yearning to explore somewhere new. With a compass forever around my neck and an Ordnance Survey map to hand, the actual chances of getting lost are slim. But that cannot prevent the real sense of adventure that accompanies every turn. The joy lies in never knowing what awaits beyond where the eye can see and in losing oneself in an unknown landscape as the lay of the land unfolds before you. But first we briefly visit A la Ronde, a nearby National Trust Property. Lady is not allowed in the house (which is par for the course and understandable.) Most NT properties do allow dogs on leads in the grounds. Unfortunately, a La Ronde is not one of them. Rather than wait, the dog and I go on a brief reconnaisance mission up a recently gritted lane to see what's out and about. 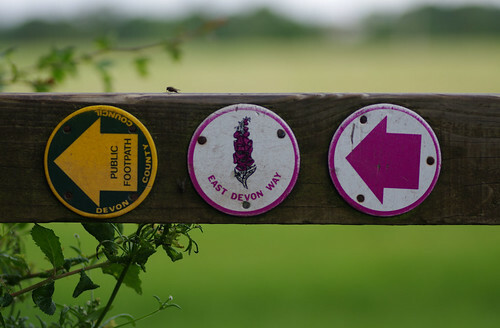 When Sherry finally returns we wander down the road and head for Lympstone, via the offshoot paths and bridleways. 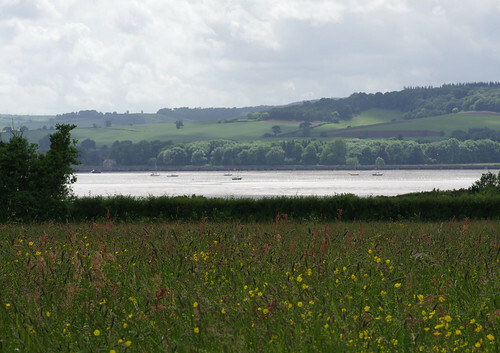 Around the edges of fields, along a short section of the East Devon Way, we see robust, healthy-looking red and white clovers, grasses swaying in the breeze and wild flower meadows overlooking the River Exe. As well as the aforementioned grasses, sorrels and buttercups provided a welcome splash of colour and the Exe glinted invitingly. We continued along the field borders and descended into lanes lined with hedgerows and common plants we have hitherto taken for granted. Distinguishing different species of docks can be problematic. But in this case I'm fairly certain the plant above was a Water Dock because it stood at head height. Perhaps next time we will be able to get the broader lower leaves in the frame as well. Later in the season, the green flowers of docks turn brown and have a charred look to them. And where there are docks stinging nettles are never far away. 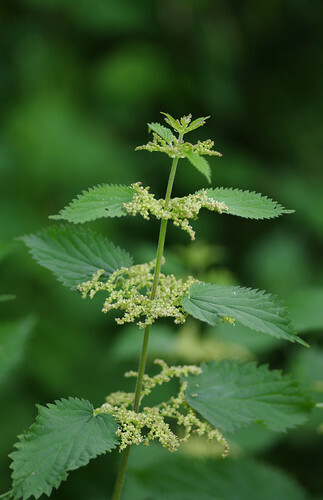 The shallow depth of field here gives the nettle a dreamy look, almost isolating the flowers from the leaves. We were edging towards the village by this point; in no particular hurry and determined not to miss anything as we passed by. They may not have the glamour and the exoticism of lilies or orchids but alkanets are among my favourite flowers. I think it's the mixture of colours: the slightly misleading green of the name, the blue flowers, the purple buds and the red dye they produce. They are abundant close to the sea, along lanes, lining hedgerows or in this case, on the path outside someone's garden gate. Our route circled the village and led through its park. Then we turned for the inward leg, along the main road. Herb Roberts, almost white, were at the side of the road and the buildings were impressive: Georgian-fronted three storey mansions whose history might be featured in a Pevsner guidebook. 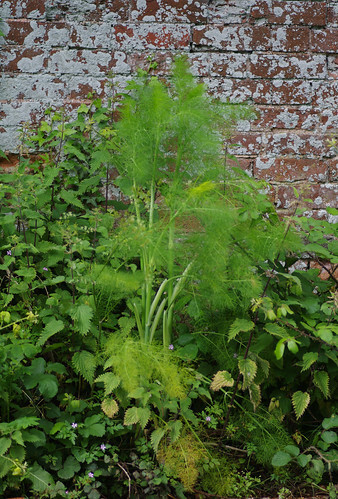 Fennel (Foeniculum vulgare) thriving in front of lichen-infested walls. There is no shortage of edible plants to forage at this time of year. With its aniseedy flavour, fennel is definitely an acquired taste but it can also complement other roasted vegetables when cooked slowly in olive oil. In the heart of the village, red, white and blue bunting was draped across the streets and the pub beckoned. 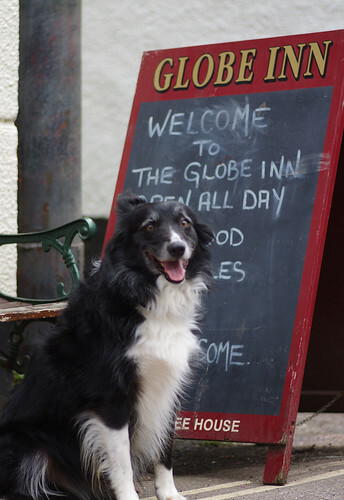 There was a warm welcome inside the Globe Inn. Lady was treated like royalty and gave the Globe her seal of approval. With all the recent rainfall everything appeared lushly green. And instead of the riot of summer colours, it seemed apt that many of the plants were well behind their flowering schedules. But even in this state there is much of interest and perhaps it is easier to appreciate the form of the plant as a whole rather than just the dazzling face. 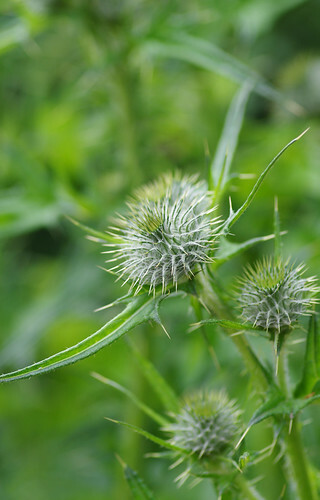 There seems to be a symmetry to all the spikes and prickles. This small, feathery fern is easily missed. 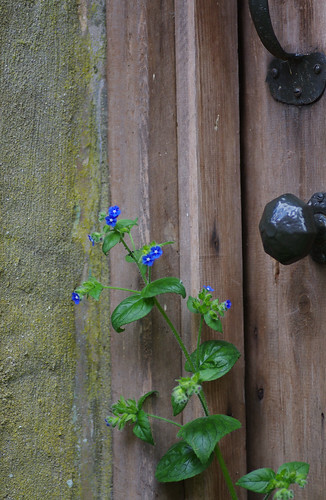 It finds its home in the crevices of stone and church walls. 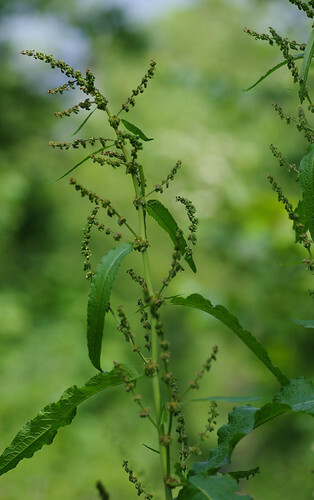 These Pennyworts, or Navelworts as they are sometimes also known (Umbilicus rupestris) were nodding their towering heads in the breeze. 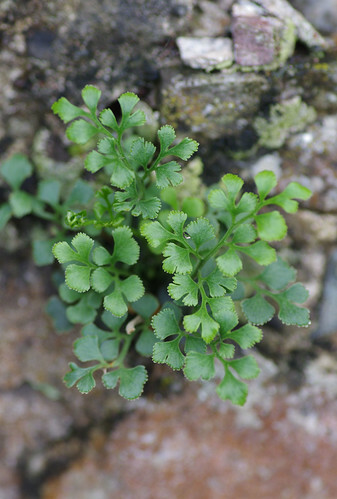 The roundish leaves of this plant are also edible and extremely variable in flavour. Some I have tried have an unpleasantly strong, slightly bitter taste. But on other occasions I have munched a Pennywort leaf and found it refreshing; somewhere between cucumber and lettuce. If you have a cheese sandwich and are short of a healthy filling, a couple of these leaves might be just the ticket. 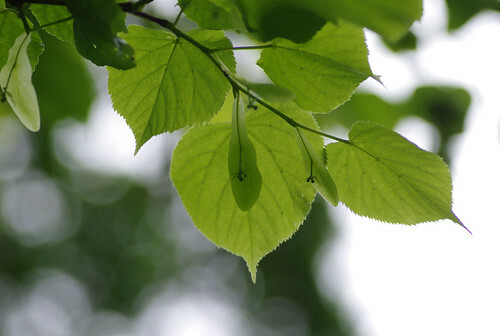 As with Jack-by-the-hedge (aka Garlic Mustard) and other edible plants, the small leaves tend to give the fresher flavour, while the larger leaves can pose a challenge. Perhaps where they grow and their particular surroundings are also contributing factors. From here we continued along a lane, passing Greater Celandines with their curly, elongated pods, the delicate white and blushed pink of fumitories and rose hip bushes until we came to our journey's end.